Another beautiful week is here and with this I have for a little Monday Morning Glamour inspiration coming from Gene Tierney, an American stage and film star who was born on the 19th of November 19th 1920. Dream big & make it happen! More vintage fun coming soon. November 12th: Pinup Wet Set Hair Workshop FULLY BOOKED! November 14th: Casual Vintage Classes, burlesque with canes! November 18th: The Boudoir Burlesque Show. December 3rd: Australian Tattoo Expo Pinup Contest Grand Final. December 10th: Vintage Pinup Workshop with the Giant Martini Glass! 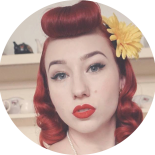 This entry was posted on November 20, 2017 by Miss Lady Lace in Monday Morning Glamour and tagged 1940's, 1950's, blogger, glamour, miss lady lace, miss lady laces pinup blog, perth burlesque, perth pinup, perth pinup blog, perth pinup community, pin up, pinup, pinup blog, pinup blogger, pinup fashion, pinup girl, pinup life, pinup lifestyle, pinup perth, red lips, retro blog, retro girl, retro glamour, the perth pinup community, victory rolls, vintage, vintage blog, vintage blogger, vintage fashion, vintage girl, vintage glamour, vintage perth, vintage pinup blog.